Have you ever walked into a room and thought something was missing or off? Your not quite sure why, but the room feels flat. Most of the time, if there is a lack of visual interest in a room, there is not a lot of variation in texture. Texture, as defined by dictionary.com ,is the visual and especially tactile quality of a surface. Look and feel - two of the most important elements in design. When you walk into a room - how do you want it to look?...and how do you want it to feel? If you are going for warm, inviting and interesting, adding texture to your decor can help to achieve your goal. Let's explore a few ways to add texture. It may sound simple, because it is simple. The quickest easiest way to add texture is with some kind of soft and yummy throw. As we head into fall, consider a beautiful chunky knit or faux fur throw. They can be relatively inexpensive, are readily available and are sure to add texture, interest and warmth to your space, especially as the seasons begin to change. The above image via Serena & Lily not only shows the throw, but also incorporates plant life and textural pillows as well. Natural rugs add texture without weighing down the room. In fact they can take a stuffy, formal room and instantly make it more inviting. They brighten a room and are a perfect base for layering rugs, which is another way to add...you guessed it...texture. In the above image via Cote De Texas blog Gerrie Bremermann uses this seagrass rug in this elegant, french antique filled room. It is so beautiful as it tempers the formality with organic texture. It simply makes the room warmer and more approachable. Genius! The above image of the foyer in Tory Burch's Southampton home, as seen in Architectual Digest, was obtained via This is Glamorous. In a relatively formal space both the plant life and the natural rug give the space life and organic texture, softening the feel and making the entire space more approachable and welcoming. Adding plant life brings both color and texture to your room. Whether you love a modern succulent arrangement or a delicate, lacy fern, organic texture adds life and warmth to any space. You won't believe the difference bringing plant life brings into your home. It is worth the effort. Most house plants take very little care- so go for it. One of the easiest ways to switch up your decor all together is with pillows. So it's not rocket science that they are a means to add texture. This sofa has three velvet pillows on it making it feel luxurious and inviting. The center pillow is not only silk velvet, but it the animal print is a strong graphic, giving it presence and grounding the rest of the pillows. Rattan and Bamboo furniture has always been a classic, used mainly in warm weather climates or sunrooms etc. Over the past few years it has been making it's way all over the house. Companies like Soane Britain make gorgeous rattan furniture, but it is very pricey. Thankfully, catalogs like Serena and Lily, Ballard Designs and Pottery Barn have several very affordable options. I have had great luck finding both rattan and bamboo smaller pieces, like the one pictured above, at thrift stores. It currently resides in my basement adding another textural element to the room, but it can easily be moved anywhere in the house. I love to add something leather to a room. I have these poofs in several colors. They weren't very expensive and are very hard working. They can be used as extra seating, as an ottoman or just something to prop up against. They are beautiful and practical...perfect. In the above photo, I have also used woven wood blinds. They are a great way to add texture and are very reasonable. I bought these right off the shelf at Lowes, had them cut to fit on site and installed them (well my husband installed them) all in the same day. Texture is often overlooked, but it is so important! It defines the look and feel of a room. It's about layering and adding dimention to your space one element at a time. 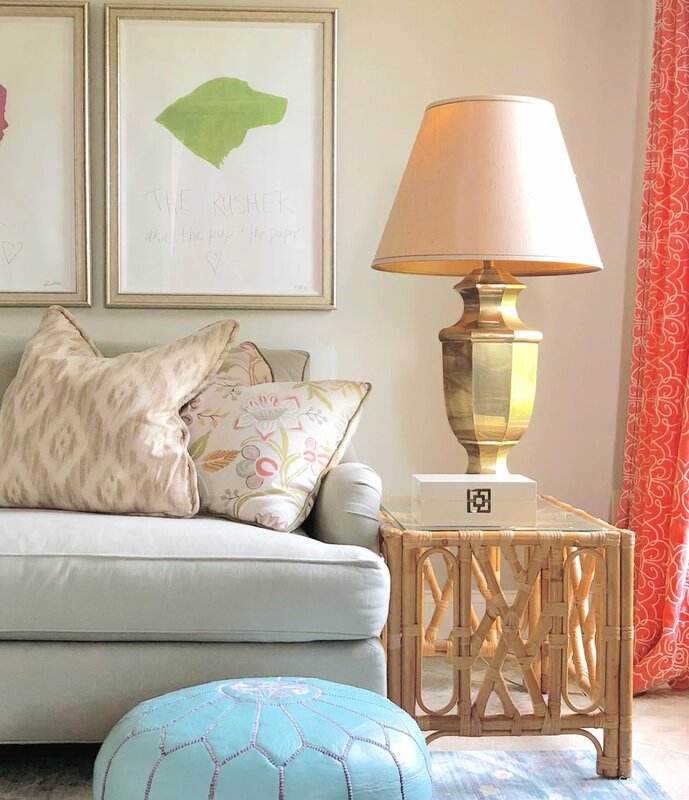 Whether you set out on a shopping spree or shop your own house, try incorporating some of these elements in your decor today. Let me know how it goes!